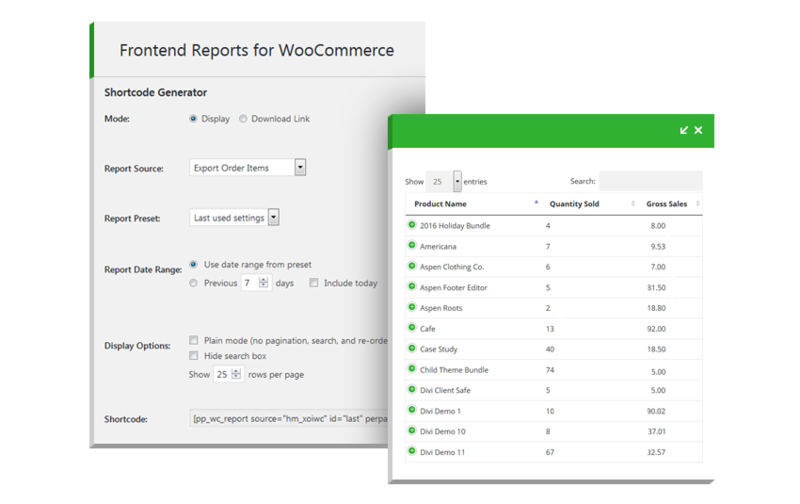 The Frontend Reports for WooCommerce add-on plugin helps businesses display WooCommerce sales reports directly within the frontend of their WordPress website. As opposed to generating a report manually and emailing the report, the Frontend Reports for WooCommerce add-on plugin lets users present a report on the frontend of a website. This is an incredible tool for WooCommerce store managers and webmasters who would like to display sales-related data without any hassle or manual effort. 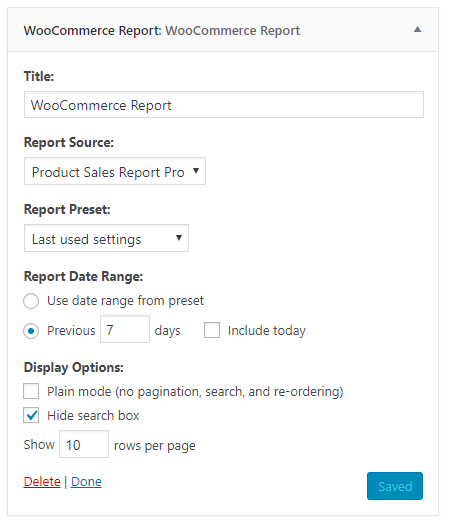 For example, when used in conjunction with a content restriction plugin, Frontend Reports for WooCommerce can be used to display sales reports to select logged in site visitors without granting access to the WordPress/WooCommerce admin area. In addition to providing an embedded interactivate tabular display of the data with sorting and searching capabilities, the add-on can also be used to provide a download link so that frontend users can download a copy of the report in the format specified in the reporting plugin’s settings. 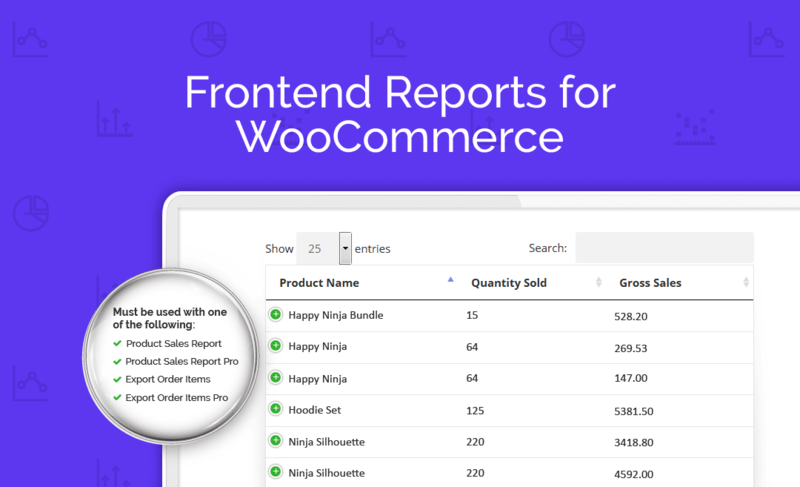 Frontend Reports for WooCommerce is not a standalone plugin, but an add-on extension that works in conjunction with compatible WooCommerce reporting plugins: Product Sales Report, Product Sales Report Pro, Export Order Items and Export Order Items Pro. Display dynamically updated reports in posts and pages using shortcodes, allowing users to view the reports without having admin access. 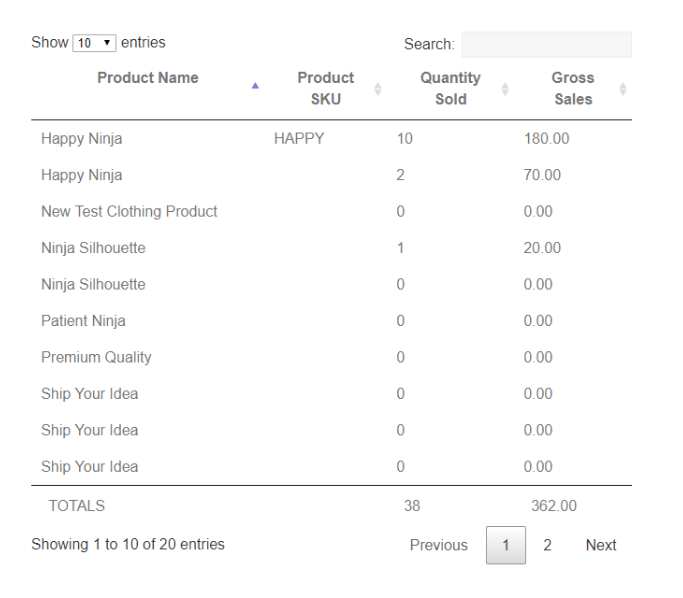 Displayed reports are paginated, sortable, and searchable. Generate links to dynamically updated downloadable reports. After installation and activation, the Frontend Reports for WooCommerce add-on plugin will add a menu item to the WooCommerce menu in the WordPress dashboard. The Frontend Reports for WooCommerce add-on plugin can be used to add an embedded report display or download link to a page, post, or other shortcode-compatible content through the use of a WordPress shortcode or widget. Once the user sets the parameters for the embedded report or report download link in the Frontend Reports shortcode generator (available in the WordPress admin under WooCommerce > Frontend Reports), they’ll be presented with the corresponding WordPress shortcode. This shortcode can then be copied and pasted into a page, post, or other shortcode-compatible content, where the report or download link will be displayed once the content is saved and published. 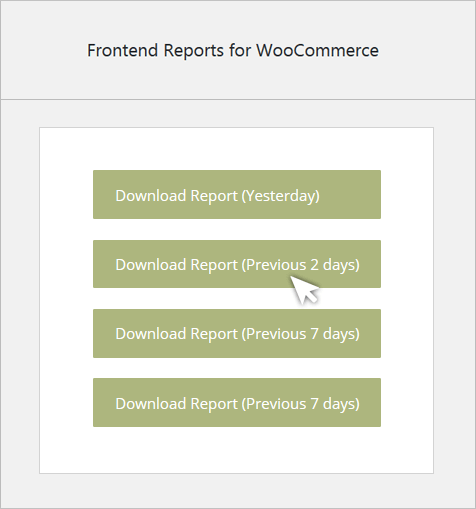 Alternatively, a report display can be inserted into a WordPress widget area (such as a sidebar) via the WooCommerce Report widget provided by Frontend Reports. The widget can be dragged into the appropriate widget area and configured on the Appearance > Widgets page in the WordPress admin. 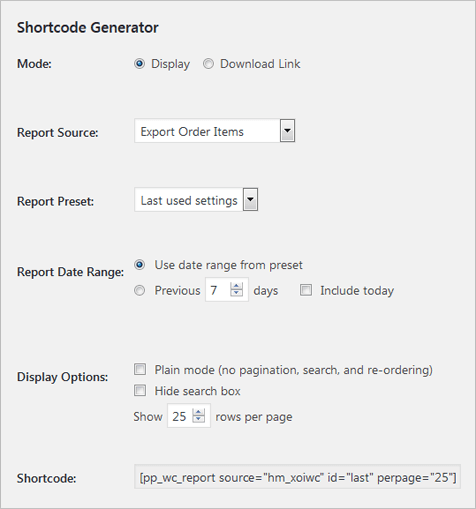 The Frontend Reports for WooCommerce add-on plugin includes a shortcode generator in the WordPress admin, featuring a single page display with all of the shortcode settings. Here the user can set the report variables extremely easily. First, the user can decide whether they’d like to display the report itself embedded in the content where the shortcode is inserted, or a download link for the report. Next, they can select which one of the compatible plugins (Product Sales Report, Product Sales Report Pro, Export Order Items or Export Order Items Pro, if installed and activated) they’re like to pull the report from, along with the report settings preset to use (if presets are supported by and defined in the selected reporting plugin). Users can also set the date range for the report by choosing to use either the date range defined in the source reporting plugin or a custom date range expressed as a number of days prior to the current day (optionally including the current day). If choosing to display the report via the WordPress shortcode rather than only a download link, the user can set a number of display options for the report, such as whether or not interactivity (pagination, search, and sorting) is enabled for the report display. Once all of the options have been defined, the user can simply copy the WordPress shortcode and paste it into a page, post, or other shortcode-compatible content to display the report or download link within that content in the frontend of their website. As an alternative to the shortcode-based method of inserting a report into the frontend, reports can also be displayed in a WordPress widget which can be inserted into a widget area on the Appearance > Widgets admin page. Once the widget has been inserted, it can be configured with similar parameters as the shortcode generator in report display mode. Sample frontend output is shown below. The display will vary depending on the reporting plugin and settings used, your Frontend Reports for WooCommerce shortcode or widget settings, and/or your website’s theme.